Each year, NEOCH honors those that have demonstrated exemplary commitment to serving the interests homeless people. We present awards to volunteers, elected officials, city leaders, lawyers, organizers, outreach workers, service providers, and more. NEOCH deeply appreciates the efforts of those who continue to relentlessly advocate for people experiencing homelessness. In particular, our Ione Biggs Social Justice Award is to remember the impact of Ione Biggs of East Cleveland, one of NEOCH's most loyal and visible members. She had a long history of fighting for civil rights and liberty in our community and raised her voice at the City Club and on Public Square against injustice. Ms. Biggs was one of the first female police officers and spent years working on social justice issues. Ione was a representative of the UN Conference on Women, and she was a champion of civil rights and equality for women in Cleveland. Ione had a unique talent for cornering elected officials to get them to do the right thing. She was able to keep in contact with all the peace and justice organizations in the city. Ione Biggs broke many racial and gender barriers, and she cast a long shadow in Cleveland. We recognize her commitment to women’s equality, peace, universal health care, a strong social safety net and an end to homelessness by awarding the lone Biggs Social Justice Award to individuals who have worked to further the struggle against injustice. The award is intended to highlight the life time achievements of social justice advocates in community service, public policy, access to justice, and equality that led to change. Paul Sherlock began working with homeless people about 11 years ago at the Homeless Stand Down. He is known for riding around the West Side on his bike and regularly goes out to the streets with Jim Schlecht. Paul worked in the clothing ministry at Malachi to get experience, and eventually began doing outreach with him and has been doing the outreach for 10 years now. Along the way, he joined The Metanoia Project board, and is interested in helping homeless people set up their own empowerment projects. He is the president of the Metanoia board, and works to help people experiencing homelessness solve their own housing issues with a hand up. Sandhya Gupta is an attorney at The Chandra Law Firm LLC, where she has been involved in all aspects of the firm's civil-rights practice, including matters touching on the First Amendment, voting rights, attorneys’ fees, and open-government law. She is a native Clevelander, and practiced at a large law firm in New York City after graduating from Columbia School of Law. She also served as law clerk to U.S. District Judge James S. Gwin of the Northern District of Ohio. Sandhya has worked extensively on get-out-the-vote efforts for presidential campaigns. Among her community activities, she also launched the Cleveland Committee of the Princeton Prize in Race Relations, which recognizes high school students for their positive impact on race relations. She was also a Fulbright Scholar to India and worked in the international human-rights field before law school. Peter Schindler assisted the Coalition with the development of the Socks Plus campaign. He regularly provides advice to the collaborative members and is always willing to deliver donated items to NEOCH. He attends events and public policy discussions and supports the Homeless Stand Down, as well as Homeless Memorial Day. He helps to dispel myths and educate the public about homelessness in Cleveland. Michelle Russell has previously won the volunteer of the year award for her work assisting to organize the women at the shelter and has served on the NEOCH Board since 2010. After her brother was killed by the Cleveland Police in 2012, Russell was the spokesperson for the family in pushing for reform. Timothy was staying at a local shelter and had befriended a women sleeping at the Women’s Shelter. Michelle regularly spoke to the media and the United States Justice Department about the out of control nature of the police that was exposed on that horrible evening of Thanksgiving weekend in East Cleveland. In 2015, a consent decree was announced with the Justice Department that is slated to make sweeping changes in the interactions between police and the mentally ill, disabled, and homeless people. There will be more oversight, independent citizen review and a fair process for investigating future police involved shootings. We recognize Michelle Russell as the 2015 Advocate of the Year for her work on police reform in the City of Cleveland. Abby Bova is a senior at Beaumont High School in Cleveland Heights, and worked with NEOCH in 2015 to assist the vendors to tell their stories. She is an honors English student and helped with the publication of the Street Newspaper. She wrote her own stories and took the time to help the Chronicle vendors to document their own lives. Abby spent the summer working on improving the public information about the Coalition including the NEOCH website. She helped the Coalition document many of the success stories of people moving from homeless to housed. NEOCH recognizes Abby Bova as the David Westcott volunteer of 2015. Norman Wolfe is a former member of the NEOCH Board and current member of the Homeless Congress. He volunteers with NOBLE, working on the Ohio state budget issues and their impact of those decisions on homelessness and those living in poverty. Wolfe is a veteran of the U.S. Navy and has had previous experience with homelessness. One of the most important programs of the Coalition that Wolfe worked to restart was the Resident Council at 2100 Lakeside. He felt that this empowered the men at the shelter to confront senior staff about problems and work on resolutions for those issues. Wolfe pushed for the Resident Council, so that residents would have a chance to voice their frustrations and not face the possibility of realiation. The meetings focus on solutions to improve the conditions within the shelter, and staff respond in writing to the concerns. The Resident Council has resulted in improved training, staff changes and better movement throughout the shelter. Wolfe has led a community discussion about the budget earlier this year and led protests, meetings, and visits to the Statehouse with Organize!Ohio in 2014 for the struggle to expand Medicaid in Ohio. Demetrius Barnes has volunteered with NEOCH for over 5 years. She regularly comes into the office almost every day and is willing to help with anything. Barnes does clerical duties, phone calls, filing, and sorts donations. If you attend one of the meetings at NEOCH, you have probably received a call from Ms. Barnes. She lives in the MidTown area and wants to give back to her community. Barnes has great hopes to use the skills she has learned at NEOCH to find a permanent job. She has volunteered for her church and for the Bishop Cosgrove Center in the past, and attends the Homeless Congress, and the Hand Up Gala events as well. Beau Hill is the Coordinator of the Harbor Light Project and contact for homeless services within the Salvation Army of Greater Cleveland. He is a co-chair of the Public Policy Committee of the Ohffice of Homeless Services and oversees the shelters, detox, community, corrections, and outreach headquartered in the Prospect Avenue facility. Heill leads the effort to reduce human trafficking in Cleveland, and has assisted the county in improving the regulations of the local shelters. The biggest sucess over the last year was the posting of rules that prevent discharge from shelters in the evening unless there is criminal activity. The other victory from 2014 was the the financing of a new family shelter in Cleveland operated by the Salvation Army. This has been a dream of many, including hHill, for years to move the Zelma George shelter into their own brand new facility built to serve the unique needs of homeless families. With funding from the State of Ohio and Cuyahoga County, the project was approved in 2014 to move the Salvation Army family shelter back into its own building near Harbor Light. 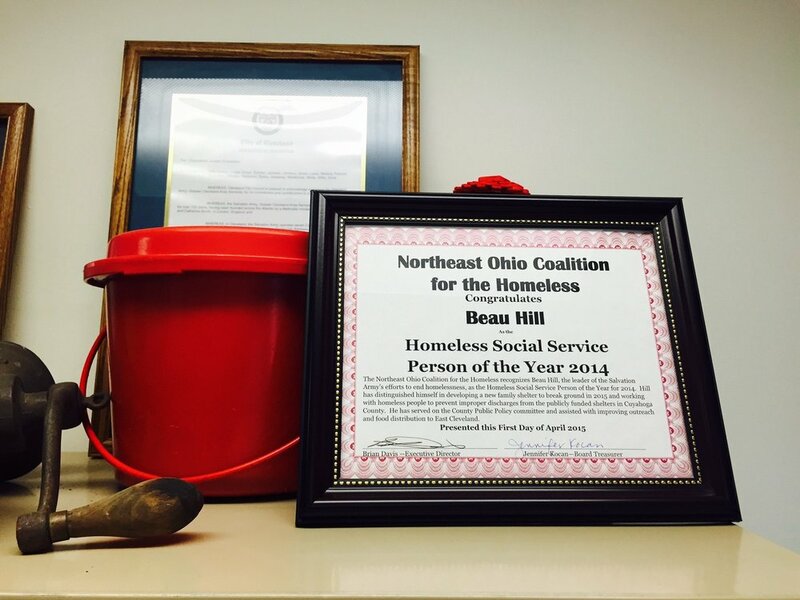 For these reasons, NEOCH recognizes Beau Hill as the Homeless Social Service Provider of the Year. Jay Westbrook is a retired City Councilman from the Detroit Shoreway neighborhood of Cleveland. He worked to create the City’s first strategic plan to address the rise in family homelessness in the 1980’s Westbrook helped create the first joint City and County office to meet the needs of homeless people. He has assisted in maintaining a City commitment to not turn anyone away who requests shelter in the City of Cleveland saving thousands of lives. He has been a strong and consistent voice to preserve and expand affordable housing and resisting community opposition to shelters and social services in the neighborhoods. Eileen Kelly is staff of St. Colman’s Church and has assisted with the creation of the identification Collaborative with NEOCH and West Side Catholic nearly 10 years ago. This unique partnerships allow thousands of dollars to be distributed to homeless and extremely low income individuals. This helps individuals. This helps individuals and families to be able to order their own birth certificate and obtain a state identification. They also have the expertise to know the rules for obtaining birth certificates across the United States, and the program has built in advocacy as a vital component of the project. Eileen Kelly has worked over the last years to continue the funding for the project, and ease the ability for homeless people to receive their identification. She has pushed the Social Security Administration and the Bureau of Motor Vehicles to reduce barriers to people obtaining identification it is impossible it is impossible to get a job, vote or find stability. Kimberly Fisher is a student at Kent State University on a break with a chronic health condition and the loss of a family member. She came to NEOCH to learn about homelessness and help the agency while she was recovering. She has a goal of becoming a social worker and displayed a great deal of compassion for the people she worked with at NEOCH. Fischer set up two Facebook pages for the Coalition and helped with our advocacy agenda. She wrote a series of articles for the Cleveland Street Chronicle and helped to update our website. Fischer really bonded with the Mature Services staff and was always willing to help. Fischer really bonded with the Mature Services staff and was always willing to help. Fischer said that she was inspired by NEOCH and she certainly inspired many of our vendors and volunteers. Maria Smith is an attorney with the Legal Aid Society, and has a long history of working to open access to subsidized housing locally and is one of the main architects of the re-entry housing programs. Maria Smith is an expert on the landlord tenant law and has assisted hundreds in avoiding eviction. Smith champions civil rights and bringing justice to the judicial system. Smith has assisted many in appealing their denial from subsidized housing, and wants public resources to be used in a just and fair manner. Smith has publicly fought against the funding of wars and defense spending by the US government and is a big proponent of equality and forgiveness. Grace is a high school student at Beaumont School who worked part time over the summer and on Saturdays in the fall to help organize the Hand Up Gala. She has a strong background participating in the National Honor Society and the drama program. She also has strong ties to her Cleveland Heights church. Grace assisted with the NEOCH public education programs and did the bulk of the work on the Hand Up Gala. It provided a wonderful meal to 200 individuals and raised $3,000 for the two organizations. NEOCH celebrates Grace Gamble as the first Student Volunteer of the Year for 2012. Jennifer has served on the NEOCH Board for six years. 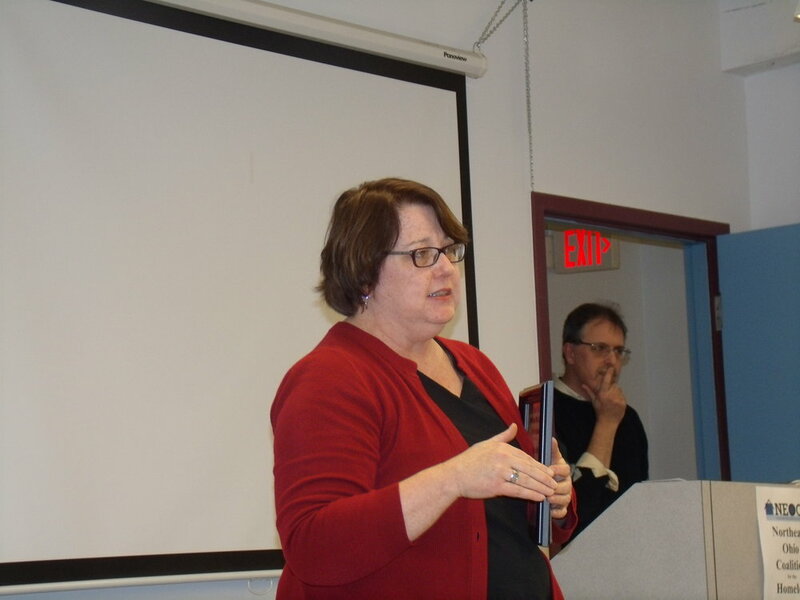 In 2011, she took a leave from the NEOCH Board to take on the role of Interim Executive Director. She worked on fund development activities as well as repairing relationships. Jennifer worked to preserve the organization and manage NEOCH through difficult times. Jennifer was busy with family, career, and her church along with her work with the Coalition. The Coalition thanks Jennifer for her volunteer service to the organization in 2011 to 2012. Every publicly funded shelter is required to submit a plan to register and then encourage their residents to vote. Cuyahoga County shelters together registered over 1,000 people in 2012. Two facilities went out of their way to encourage voting among their residents. We recognize The North Point Transitional Shelter and The Salvation Army Railton House Shelter as Homeless Voting Champions for 2012. We recognize Jeff Bricker at North Point and his staff for leading the effort to register every resident and help get them to the polling place. We also recognize Shindana Frazier and her staff for her efforts at Railton House for working every week to encourage voting activities. State Senator Nina Turner has championed the rights of voters in Ohio for the past two years. She attended many of the rallies in 2012 to protect the rights of voters. Senator Turner advanced legislation to expand access to the ballot box. She worked to expand weekend voting in Ohio, which 76% of the individuals we registered took advantage of in the November election. For all of her work to expand the rights of low income individuals, we recognize Senator Turner as the Advocate of the year for 2012 election. Subodh Chandra has represented the Coalition in a lawsuit against the State of Ohio regarding the requirement that voters present some form of identification in order to cast a ballot when voting. We settled this suit in 2010, and Chandra helped to challenge a violation of our settlement in Hamilton County. This settlement will govern the 2012 Presidential election and has forced the state to count provisional ballots in a consistent manner in every county. Chandra operates the Chandra Law Firm and was the previous law director for the city of Cleveland. He is a former federal prosecutor and graduate of Yale Law School. He is married to a civil rights attorney and father to triplet sons. When the Cleveland Street Chronicle restarted in late 2010, Brent Stowe stepped up and offered his design and production skills to the Coalition to assist with the publication of the paper. Stowe works at American Greetings and has a background in digital graphics and preparing artwork for printing. He is a graduate of Kent State University and resident of Lakewood. Brent may be joining the NEOCH Board in the near future. We could not print the paper without his help. Retired from the May Dugan Center last year, but has continued working to protect the rights of low income and homeless people. Tim is an authority in Cleveland on public utilities and how low income residents navigate this complicated system. Tim has helped create the state advocacy group, ABLE, in order to help lower income families lobby for justice in the state budget. Walters regularly volunteers with the Metanoia Project and Project Save. He attends the Homeless Congress to listen to the views and opinions of homeless people. 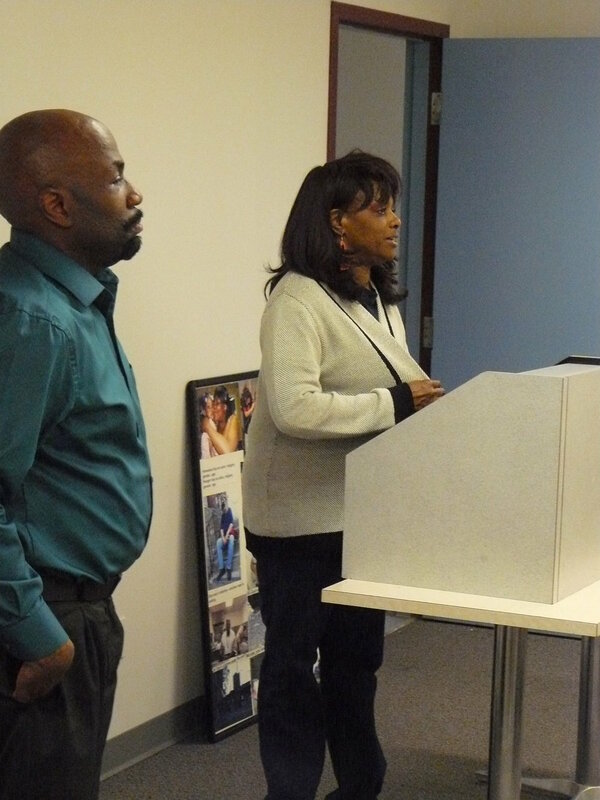 Walters has helped improve the outreach safety net in Cleveland and has successfully integrated advocacy with the human service needs of homeless people to support the NEOCH mission. Came to NEOCH in 2006 as a volunteer by way of the Cleveland Tenants Organization. He is a veteran of the US military who has taken a leadership role within his church and the apartment buildings that he lives in. Larry previously was an AmeriCorps VISTA for a year and a half, and now is a Mature Services member doing community organizing for CTO. He regularly volunteers 20 hours a week at NEOCH to help with the Street Voices project and assigning volunteers useful work for the organization. Larry is a key member of the Stand Down leadership committee and started a blanket and winter clothing drive at NEOCH in 2009. Is the current program director at the Bishop William Cosgrove Center that provides hundreds of meals to homeless and very low income individuals every day. She has worked for Catholic Charities since 1999, and before that worked for the Cleveland Food bank. Nicole is currently enrolled at Cleveland State University pursuing a degree in urban studies. She has always been willing to go the extra mile to help people in need with programming and a healthy meal at the city’s largest day shelter. In 2010, Nicole worked with NEOCH to successfully stage the Hand Up Gala, Which provided a wonderful fine dining meal to 85 low income individuals; Nicole has also worked for years to prepare the food for the Homeless Stand Down. Russell has volunteered every week for the past eight months at the Coalition helping with writing grants, fundraising and coordinating the resident council at the Community Women’s Shelter. She has a background in account management, financial analysis and marketing. Russell is involved in the From Darkness to Light non-profit providing direct care to homeless people, and has a strong commitment to her faith. She volunteers as stewardship director and the women’s ministry with her church. Russell joined the NEOCH Board in August 2009 and is always willing to lend a hand to those struggling to find stable housing. Piepsny is the Executive Director of the Cleveland Tenants Organization. He has been extremely supportive of the Coalition over the last three years including the taking over of the Bridging the Gap program so that it was not lost to the community. He oversees the eviction diversion program so that people do not fall into the shelters. Piepsny helped with a series of fair housing forums last year for those living in transitional shelters. He has helped with the development of a Housing Trust Fund and the collaboration on finding job for those low income individuals in Cleveland. Finally, he was the co-convener of the homeless prevention collaboration with NEOCH in 2009. David served on the NEOCH Board for eleven years. He came to the organization in the early 1990s as a true advocate for homeless people. He pushed the agency to rise above every barrier to focus our attention on an end to homelessness. David was always frustrated with the pace of change in this community, and wanted to see religious, government and social service organizations come together to reduce the number of people sleeping in shelters. He was a real asset to NEOCH by improving our systems and operations and guiding us through rough years after September 11 and the beginning of this latest recession in 2007. He was a former Army officer in World War II and Korea. Westcott served as Executive Director of the Lutheran Council of Cleveland and as a social worker at WESM. He volunteered with Brookside Family Neighborhood Center, International Partners in Mission (IPM), and the ACLU. He was proudest of his work as a Board member of IPM building a solid organization that reaches out a hand in peace and in the model of the teachings of Christ to lift up disenfranchised populations in El Salvador, Beruit, and India. He was the 2002 Homeless Advocate of the Year as selected by the Northeast Ohio Coalition for the Homeless. Is an attorney currently working for the federal government, and she gives up most every Monday afternoon volunteering for the Homeless Coalition. Ext assists with our advocacy agenda in Cleveland. She has volunteered with the Homeless Stand Down, and has worked on many of NEOCH’s research reports. She has previous experience at the Legal Aid Society, and is a law school graduate from Harvard. Ext did her undergraduate work at Rice University, and has a strong interest in social justice. She relaxes by playing basketball and was recently married. Margaret Wilson is the current Outreach Coordinator at GESU Roman Catholic Church. She plans all parish wide activities including the Homeless Coalition. Wilson has been a board member since 2002. Wilson has always been an active board member, and is regularly involved in policy and advocacy strategies. She is a former teacher who has taught at the junior high, high school and college levels. She has Bachelors in Political Science from Catholic University of America as well as a Master degree in Education. She also has a Masters in English from Cleveland State. Wilson has worked to establish the Interfaith Hospitality Network at GESU Catholic Church. The GESU commission is active in the community and has worked with a number of organizations, including FAMICOS, New Life Community, and Sociedad de los Amigos de Niño’s in Honduras. Gail Long became involved in a broad range of social, political and economical justice issues, such as the anti-war movement, bridging the racial divide, fighting for state budget equality, and universal access to health care. She passionately fought for her constituency on the near west side of Cleveland through health care accessibility and affordability by creating a county-wide coalition called Citizens to Save Metro Health that fought against any privation of Metro Health hospital. She has served on the Cleveland Housing Network Board as well as the Cleveland Tenants Organization’s Board to preserve and expand affordable housing opportunities. Long did extensive work with Cuyahoga County to protect low income families through two decades of reform of the welfare system. Long’s tenacious commitment to stand, walk and work with disadvantaged people is why the committee chose Gail Long as the 2008 Ione Biggs Award winner. We present this award to Gail Long, and her name will be placed on the plaque kept in the main office of the Coalition. Bryan worked through all the bureaucratic obstacles to create a program at John Carroll University where faculty and students venture off the campus to downtown Cleveland to interact those resistant to shelters through the Labre Project. He is a true leader who, with his continued nurturing of the Labre Project, he sets an example for others. Bryan recently helped to open an overnight drop in center at St. Augustine’s center, which provides a warm place for homeless people resistant to come inside. 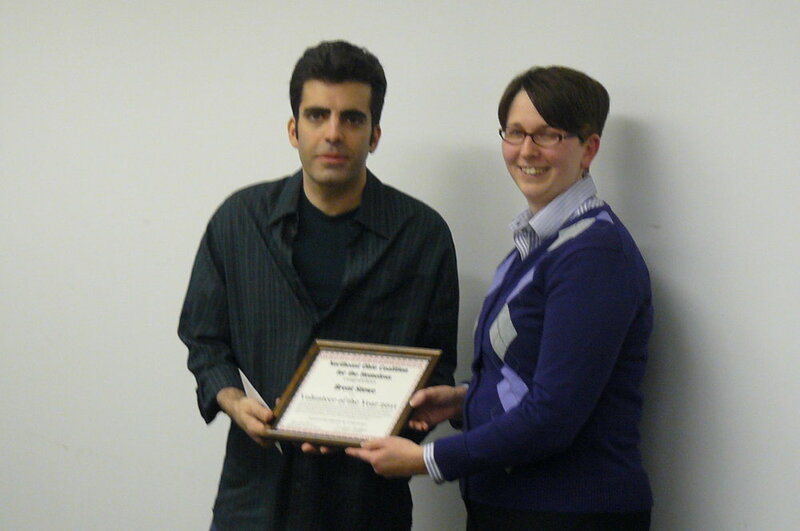 NEOCH salutes Bryan Mauk for service to the homeless community. Robert C.Heintel and Ronald E. Falconi are both members of the Cleveland Metropolitan Bar Association. Together they handle the West Side Catholic Center. Without their help, it would be difficult to maintain West Side Catholic Center as an intake site. Both of these lawyers reflect the highest standards of the legal profession. They are dedicated to providing legal assistance to people who are unable to hire lawyer. 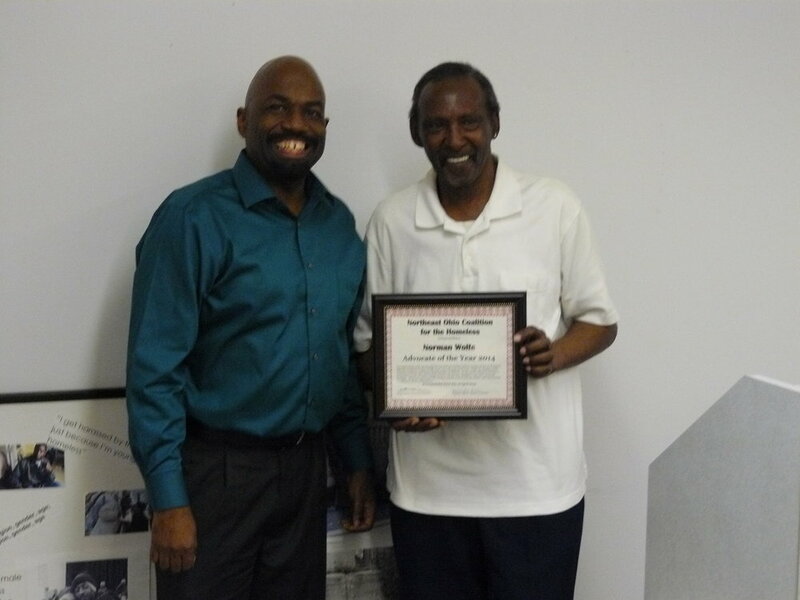 NEOCH salutes Robert and Ronald for their service to the homeless community. Mayor Frank G. Jackson was the recipient of the award because of his extensive work in assisting low income and homeless people in the city of Cleveland. He was the council president when the Department of Housing and Urban Development began dismantling affordable housing. The call from Washington was that the housing was deplorable and needed to be taken down. Jackson mobilized the community to oppose this policy. He said many times that HUD allowed the housing to deteriorate and therefore has an obligation to replace the housing. He mounted a campaign to prevent the wholesale destruction of thousands of affordable housing units and the bulldozing of entire neighborhoods. Jackson was successful with a number of new townhouses built in the Central neighborhood of Cleveland. Jackson has a long career in community organizing and preserving affordable housing. He was a tenant leader before getting into politics while attending law school. He was the first Mayor to speak to homeless people at the largest shelter after taking office. He helped ease the tensions between police and homeless people that resulted in so many lawsuits in the 1990s in Cleveland. For his lifetime service and commitment to ending homelessness in Northeast Ohio. Jim is a long time outreach worker for Care Alliance. He has worked in food programs and shelter services. He regularly helps with transportation and housing application. He provides identification to homeless people on a weekly basis with his office hours at Cosgrove Center. We held a celebration of Jim Schlecht in 2013 and have a gallery of this event on our website. For the service given to the homeless community as well as dedication and time given to the Coalition. Janes volunteered to write for the Homeless Grapevine newspaper and volunteered to assist at many of the NEOCH events. For six Years of service to the Coalition and commitment to ending homelessness. 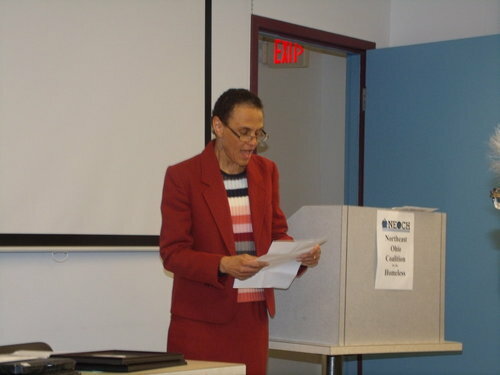 Marcia served on the NEOCH board and worked in shelters and social service providers in the community. She had served as a member of the VISTA program, and helped to establish the Homeless Stand Down as a major event in Cleveland. For the service provided the homeless community as well as dedication and time given to the Legal Assistance Program. Both are fine attorneys in the community and have volunteered for years for the program and have assisted hundreds of homeless people. In recognition of his fair and ethical reporting given to homeless community over the years. Tom Beres was always fair with fragile individuals in the community. Beres is a senior journalist in the community with a wealth of knowledge about the history of Cleveland. For his six years of service to the Coalition and his commitment to ending homelessness. Roy was the homeless ombudsman in Cleveland and a member of the 211 First Call for Help team. He regularly represented NEOCH at local community events. For their commitment to volunteering with the Homeless Grapevine. For his lifetime of fighting for social justice in Northeast Ohio. Foley was the Executive Director of the Cleveland Tenants Organization. He was a founder of the Cuyahoga Affordable Housing Alliance and the Housing Cleveland website. He left CTO to join the State legislature. For his commitment the past year in preparing the Tenth District Homelessness Summit, assuring that homeless people are not forgotten within the Federal Government. Marty Gelfand has helped the Coalition with setting priorities and making those program priorities a reality in Cleveland. Gelfand was staff to Representative Dennis Kucinich and one of the founders of the Cuyahoga Affordable Housing Alliance. For his six year commitment to serving homeless people as a member of the Board of Trustees and willingness to participate whenever needed to assure that homeless people’s voices are heard. Ron was an advocate for the merits of transitional housing and was a huge proponent of sober living. For her hard work on NEOCH’s annual meeting, her participation in the development committee, the Community Voice Mail program, and her willingness to always lend a helping hand. Denise assisted with our annual fundraiser, and helped with writing grants. For her commitment the past year, helping with the Make A Difference Day, making calls and helping with mailings, She assisted as a human rights observer and coordinated distribution of materials. For his four year commitment to serving homeless people as a member of the Board of Trustees and willingness to participate whenever needed. David was a long time treasurer of the organization and kept the Board on task. For her hard work on NEOCH’s, database her participation with the stand down and her willingness to always give a helping hand. For her assistance in a photography project NEOCH is developing. Heather is a student at Case Western Reserve University with a cheerful demeanor and always a pleasant outlook. For her six year commitment to serving homeless people as a member of the Board of Trustees. Toni worked with homeless children and veterans. Toni is always raising issues in the community that make it difficult for homeless people. For her vigilance and commitment to social justice, Lisa acted as a fair minded and hard working editor who never forgot her role as public watchdog and superintendent of democracy. Lisa was Editor of the Free Times, and regularly published investigative pieces and hosted advocacy journalism in Cleveland. For his dedication in creating the Cleveland Homeless Legal Assistance Program. He is also an attorney at Porter Wright Morris and Arthur. He assisted with bringing the program to the Cleveland Bar Association, and expanded the program by adding volunteers. For her weekly commitment to serving NEOCH in whatever capacity necessary. For his cheerful demeanor, and ability to turn even the most mundane tasks into important undertakings.